It might seem unlikely to some, but a real political revolution is underway in the US right under our noses. The deeply underwhelming start to the American presidential campaign has unexpectedly evolved into a significant social phenomenon that could well have far-reaching consequences. Candidates from each of the two mainline American political parties, the Democrats and the Republicans, are gaining traction not only without the support of their party leaders, but in many ways in opposition to them. The popular Republican front-runner, the conservative billionaire Donald Trump, preaches «revolution from the right», while over in the Democratic camp, the typically leftist, non-materialistic Bernie Sanders is steadily gaining on Hillary Clinton, agitating for «revolution from the left». Both are sternly critical of the establishment and demand major changes in America’s social and political landscape. We are watching the two leading American political parties, which were previously not all that different from each other, moving toward a classic right/left model of opposition, such as what is found in Europe and throughout the rest of the world. To a certain extent, what is happening can be compared to the reversal of roles between Democrats and Republicans that occurred after Dwight D. Eisenhower took office in 1953. Previously, and throughout US history, liberal views, particularly on racial segregation, were more characteristic of the Republican Party, while Democrats were more conservative. But when the celebrated General Eisenhower, the favorite in the race, decided to run as a candidate from the Grand Old Party (the GOP) that party adopted his more conservative stance, ceding its liberal past to the Democrats. And the Republicans have retained that identity ever since. But that inversion was only a reshuffling – «castling short» in chess terminology – and a move that confirmed the absence of a coherent ideology among American politicians, but with no effect on the rudiments of the system. But what is happening now could be looked at as a version of «castling long», with far-reaching consequences for the entire mechanism of government. But something that the two developments have in common is that – both then and now – the political changes began at the top. The main difference is that in an era in which information technology is widespread, the public are no longer merely bit players, but can determine the nature of the emerging transformations to a much greater extent than was possible over 60 years ago. 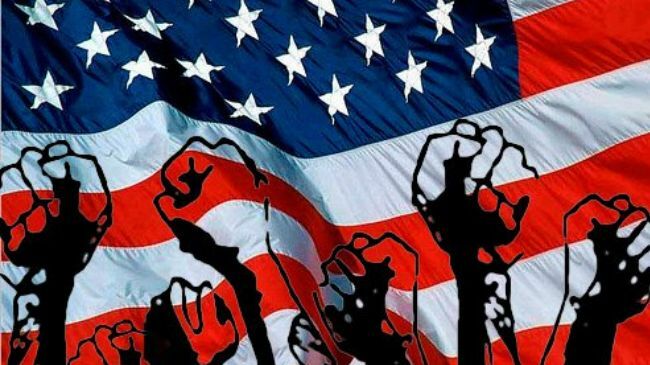 In a sense, the pervasive hunger in the US for radical changes in its social and political structure is nothing more than the returning boomerang of the «color revolutions» and other upheavals (such as the hot Arab Spring and the cold European autumn, etc.) launched by Washington. These disturbances, which were set in motion with the goal of retaining America’s global hegemony while masquerading as lofty polemics about freedom and democracy, affect the perceptions of not only those to whom they are addressed, but also the domestic audience. Americans are beginning to wonder whether the US itself is complying with the demands it makes of others. And perhaps the time has come for a windy «American winter»? Given the rising dollar and growing industrial production in monetary terms, as well as low oil prices, at first glance, such sentiments can hardly be explained by the actual socio-economic picture in the US. Why work to change something that’s already wonderful? But it’s not that simple. The rise of the dollar is largely speculative in nature and is not supported by either growth in labor productivity or manufacturers’ profits. Only the most powerful movers and shakers on the financial markets are feeling its effect. The American economy is rapidly becoming less competitive. During 2014 the dollar strengthened 16% against the currencies of America’s key trading partners and has continued to substantially rise in 2015. It’s no wonder that this pattern has vexed the US companies that depend on exports. The world’s largest manufacturer of household cleansers and personal-care products, the American company Procter & Gamble Co. (P&G), had to report a 31% reduction in profits because of «unprecedented» pressure on the foreign exchange market. Revenues at the largest US firms on the S&P 500 Index fell 46% because of the stronger dollar. From Pfizer and McDonald’s to DuPont and Microsoft, all had to pay a high price for a strong dollar. Even Apple, which actively hedges against foreign currency risks, could not avoid trouble. The company’s CEO, Tim Cook, made it clear during his conference call on earnings that what is happening in the global economy is having a negative impact on the company’s performance, because of «fierce foreign exchange volatility». The fledgling recovery of the US economy runs the risk of coming to a quick end, as the rising dollar is killing American exports and the foreign-trade deficit is growing. As a result of low global energy prices, the American «shale revolution» is on the verge of collapse. The drop in revenue means that those companies can no longer afford to pay off their loans and are shutting down thousands of pits and laying off workers. The relative prosperity could be replaced with the bursting of a new bubble. People understand this. Yet Americans’ increased proclivity for protest stems not so much from fears of a possible reduction in their standard of living, but from a change in their perceptions of the ways in which the configuration of American society meets the needs of the 21st century. The archaic system of indirect elections through the Electoral College in the United States, in which voters in each state have the right to select a quota of electors, who then cast their votes for candidates who have been nominated in an entirely nontransparent process, in which «big money» calls the shots, every conceivable trick is used to muddle voters’ minds, candidates parade their rivals’ dirty laundry, and underhanded political strategists maintain their stranglehold, is becoming an increasingly forceful irritant. And in a completely bizarre situation, a US president can be elected without winning the popular vote (this has happened more than once, from John Quincy Adams to George W. Bush) or be simply delegated by his party without any kind of election, like Gerald Ford. There is no doubt that demand will continue to grow for the democratization of the American political system and a move toward direct elections. Otherwise, the absolute presidential power that Arthur Schlesinger described as «The Imperial Presidency» is not far off. 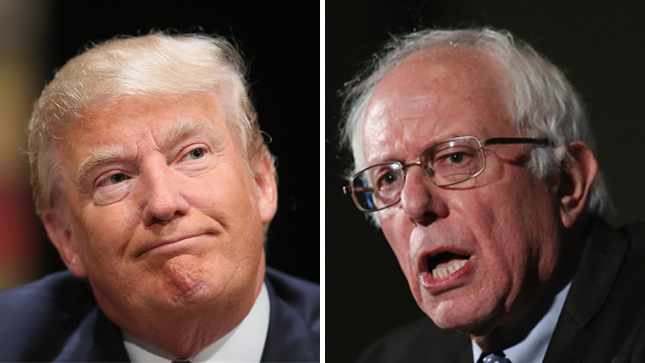 Bernie Sanders claims that the United States should emulate Europe and Scandinavia. He has stated that he is «very frightened about the future of American democracy when this becomes a battle between billionaires. I believe in one person, one vote», and also, «We need a political revolution of millions of people in this country who are prepared to stand up and say, ‘enough is enough’ ... I want to help lead that effort». Donald Trump does not urge Americans to take their cue from Europe, but even he advocates for a direct dialog between power and people without the intrusion of unnecessary intermediaries. In this, Sanders and Trump are similar. As the experts note, «Bernie Sanders the socialist and Donald Trump the plutocrat are addressing much the same impulse. Speaking in clear, declarative sentences ... [they] are seen by their followers as ‘telling it like it is.’» Charismatic spokesmen for the views they espouse, both in their origins, life experiences, and even in their physical appearance, Sanders and Trump are the ideal engines behind the emergent restructuring of the American political system on a «left-right» gradation. On one hand we have a typical Jewish rebel intellectual, á la Karl Marx and Leon Trotsky, while on the other – a complacent, corpulent billionaire. But of course the «counter-revolution» won’t be caught napping either. And both parties’ «Central Committees» – as well as the Washington «Politburo», as represented by the National Security Council, which is chaired by the president / «General Secretary» – will do everything possible to put an end to these developments. But the trend is plain to see. The rise of this «anti-system» in the current US presidential campaign is too meaningful to simply explain away as a coincidence or anomaly. It would seem that the transition to a multipolar world is quietly affecting even the political system of this final empire, which is becoming less monolithic and more pluralistic. It looks like we are witnessing the dawn of a profound transformation of the world’s leading power. Even its turn has come at last. Only the future will show how quickly these developments will evolve and whether they will be accompanied by shocks, which are especially possible, given the extremely heterogeneous ethnic and social makeup of the American public.